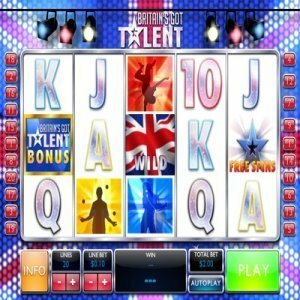 [miau] If you’re a fan of the show, “Britain’s Got Talent,” you’ll love Britain’s Got Talent Superstar slot machine. This game is based directly off of the show, and you’ll find a lot of similarities between the two. If you’re looking to win some big money in this slot game, you could win up to 1125x’s your total bet amount. There is also a live show bonus, as well as free spins. In order to get the live show bonus, you need to get the correct symbol on reels 1, 3, or 5, and it will trigger the live bonus round. If you get the correct symbol on reels 1, 2, or 5, you can earn free spins. If you end up getting the free spins, you can look forward to winning up to 20 free spins in the game. This game really caters to those who are looking to win some money with its high payouts. The opening page has a picture of the Britain flag in the background, while pictures of talents, will scroll across the bottom of the screen. The game has several different symbols that you’ll see when you begin to play. Bright, colorful lights, adorn the top of the game, presenting it as a stage show. The symbols on the screen are letters, numbers, silhouettes of people in different stances, a free spins symbol shaped like a star, and a Britain’s Got Talent bonus symbol. This is a five-reel game with 20 pay lines, and the bet amount starts at as little as one penny, and goes up to an incredible $50 per line. You can easily bet $1,000 just by spinning the reel one time, if you put the maximum bet, with a total of 20 pay lines. Whether you’re looking to be a high roller or not, this is still a great game to play. This game has wilds, scatters, bonuses, and free spins. A wild can substitute for any symbol, except for a scatter, which is normal in many slot games. A wild symbol will be the Britain flag, and these are the best, because the payout amount is incredible at 10,000 coins; depending on your bet. The next highest payout amount is 1,500 coins, if you get the silhouette of the woman holding a microphone. Other payout amounts vary, depending on the symbol, and there are 1,000, 500, 100 coin payouts, and lower. If you can, you should get to the bonus round. Once you play in the bonus round, you get to pick from three categories which is dance, musical, or novelty. You choose who will be your representative in the bonus round, by spinning the wheel. The act that you choose will go through different auditions, and you should make it to the end, before being rejected by all four judges. The louder the applause, the bigger your prize.